One of the biggest debates in modern microbiology revolves around this question: are viruses living organisms? As you might think, this isn’t quite a black and white question. In order for something to be classified as a living organism, it needs to be able to replicate on its own. Viruses however, are incapable of this – they need a host cell to replicate and ‘live.’ Once inside a cell, a virus can then perform the same functions living cells can – like producing proteins, replicating, and protecting itself form danger. A viral life cycle contains five different distinct phases: exposure, entry, replication, shedding, and latency. Generally, a viral infection occurs when a host (i.e. Human) is exposed to a virus. This can be through a physical breach (a cut in the skin), direct inoculation (unsafe needle injections) or direct infection of the surface (inhaling the virus into the lungs). Only after a virus enters the host, can it gain access to certain cells to infect. 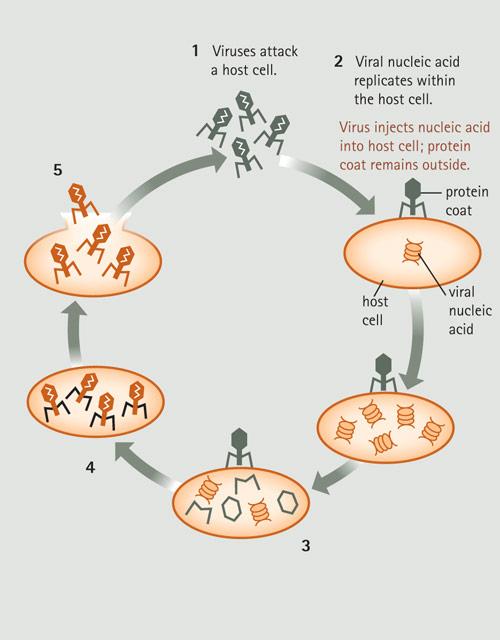 Once a host has been exposed, the virus needs to enter the host’s cells; and when inside the cell, the virus hijacks the cell’s machinery to replicate. To get inside the cell, proteins on the viral surface connect with proteins on the cell surface which results in the creation of a pore. Using this pore, viruses enter the cell and begin making copies of itself. Next, the virus takes control of the cell’s replication machinery and quickly begins making millions of copies of itself. Once a virus has made enough copies and used up all of the resources inside a cell, shedding occurs. The cell is no longer useful for the virus, and so the cell dies and all the new viruses are released to now infect new cells. Some special viruses, like HIV, have a latency period. During this time, the virus hides inside the cell and does not replicate in order to evade the host’s immune system. The virus waits, until the time is right to begin replication and start the infection. As you can see, this question is a difficult one to answer. When you look at the viral life cycle, arguments can be made for both sides; but ultimately, regardless of whether viruses are classified as living or not, efforts should be placed on developing vaccines and treatments. One of the main barriers to ridding the world of hepatitis C is the lack of awareness and education. And one of the main barriers to widespread awareness, is language diversity. This is where this resource comes in. yourlanguage.hepcinfo.ca is a resource page with different language options. The goal is to provide the same information in various languages. 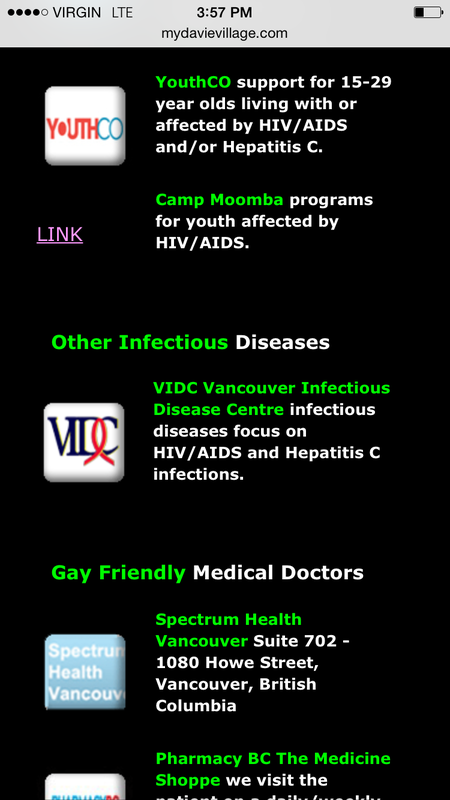 The resource page is created and maintained by CATIE, Canada’s source for HIV and hepatitis C information. Following their commitment to providing HIV and HCV information to Canadians, CATIE recognizes the needs of a multicultural nation such as Canada. The website has a very simple and easy to understand design. The language options are displayed on a banner at the very top of the page and a hyperlinked table of contents can be found on the left side for ease of access. Basically, as long as you can get to the website, there is almost no reason for you to not get the information you need — if the language you speak is listed! Currently, the website offers information in 12 languages — Arabic, Chinese (simplified), French, Spanish, English, Filipino (Tagalog), Bengali, Tamil, Hindi, Urdu, Punjabi, and Vietnamese. This is a great resource for interested individuals, health care providers, and even educators. If you know anyone who needs to understand hepatitis C but has very limited knowledge of English, this might be the resource you’ve been waiting for. 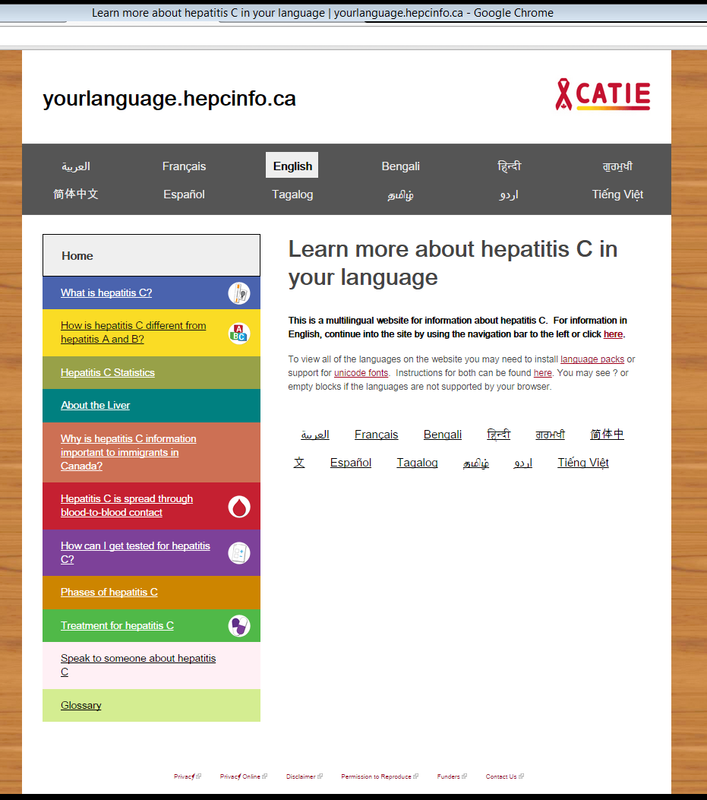 yourlanguage.hepcinfo.ca displaying “What is Hepatitis C?” in Chinese (simplified). Last Friday, June 19, we had one of our Lunch Talks at the clinic. Our very own Dr. Brian Conway gave a mini-lecture over lunch — sponsored by Merck — on drug interactions. Bottom line: Be aware of what you’re taking! The talk was very informative and quite extensive for the amount of time we had, and typing up all that information would be too much for a blog post! 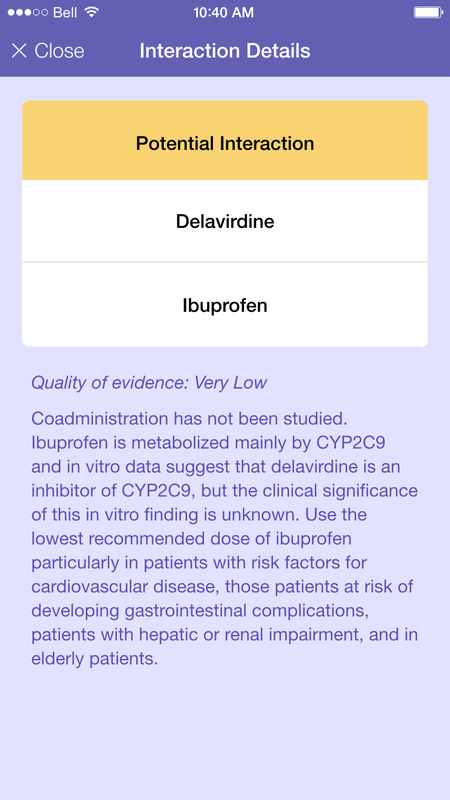 Fortunately, Dr. Conway gave us a shortcut to all that knowledge: The University of Liverpool’s Drug Interaction websites! 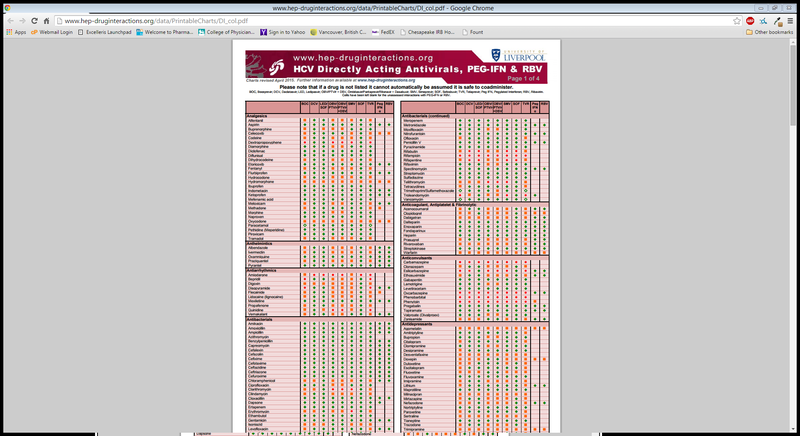 There’s the http://www.hiv-druginteractions.org/ for HIV drugs and http://www.hep-druginteractions.org/ for HCV (Hep C) drugs. 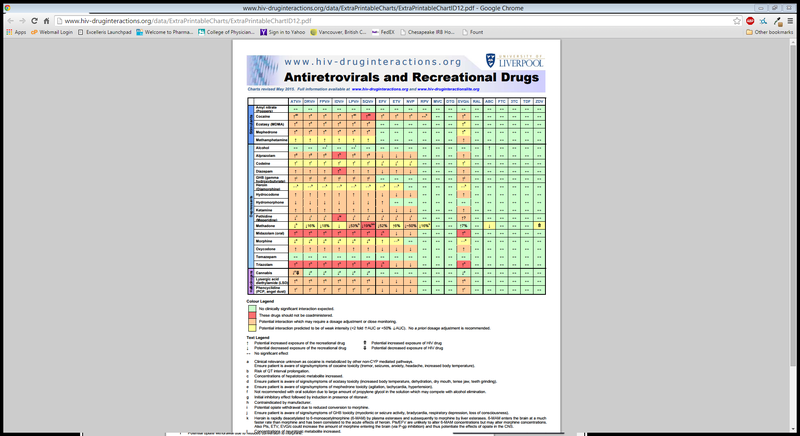 Basically, the site allows for public access of PDF charts detailing which drugs have interactions with each other and whether or not these interactions are negligible or deadly. It has a very easy-to-understand scheme: interactions labeled in GREEN are drugs you can take together, YELLOW are drugs you want to take with caution, and RED labeled drug interactions are just NO. And for people interested in why the labels are colored as such, the site also has an area detailing the information behind the specific labels. 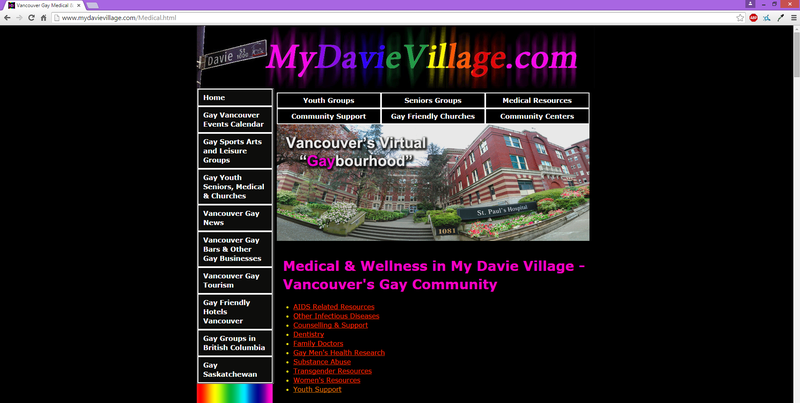 The sites are very informative and user-friendly. And also quite comprehensive — from Ibuprofen to Cocaine to other antivirals! An example of what a printable chart looks like. Labels are colored for easy scanning, and symbols are used to give more information about the specific interactions. 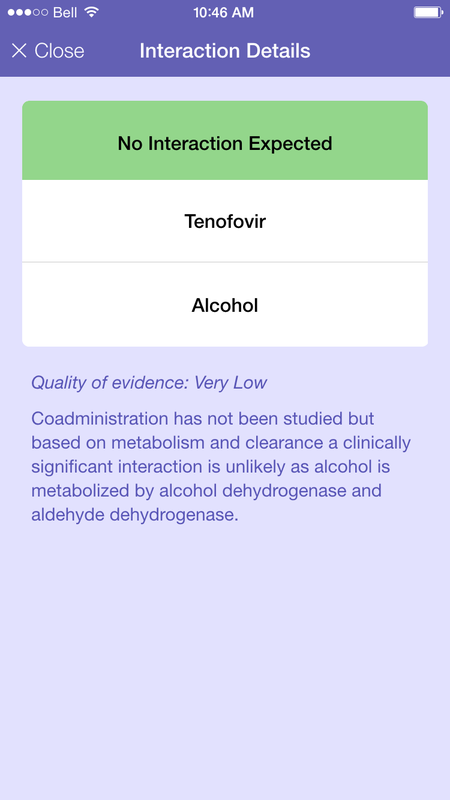 An example from hep-druginteractions.org. 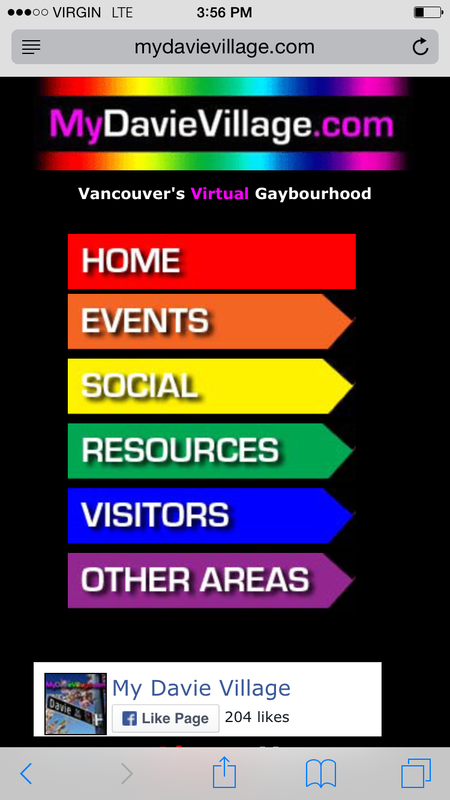 Different symbols, same color scheme — green, yellow, and red. They also produced (free) apps! These are available in both the Apple App Store and the Google Play Store. Click on the photos below for the Apple App Store. 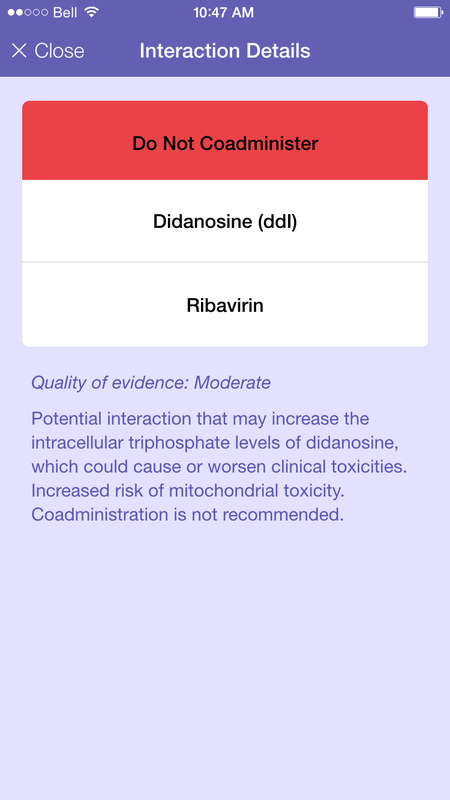 Or search for HEP iChart and HIV iChart for the HCV and the HIV drug interactions app respectively. You start by selecting the HIV or HCV drug you’re interested in and then select the other drug (cough medicine, pain medication, recreational drugs, alcohol, etc.) you want to check and voila! Just like the charts, if it’s safe, the label is green. Yellow if co-administration should be done with caution. Red if the interactions have adverse effects and co-administration should not be done. This is an amazing resource for individuals living with HIV or HCV (Hep C), the health care professionals working with them, and family and community members that want to look out for them. A convenient cheat sheet in the palm of your hand — or on your wall if you choose to print the charts out. HOWEVER, these apps and charts do not replace your doctor’s orders. Always run things by your doctor if you’re unsure of the medications you’re taking.